Hook type panels which directly replace wire cloth on standard crown decks. Available in 90 duro "A" urethane material, "AH" material, and 60 duro "D" material. 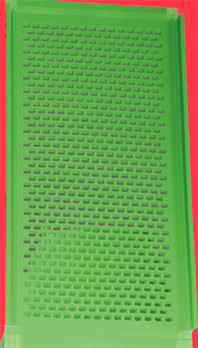 Orithane screen mats are without steel reinforcement.Aperture are moulded or punched as per the application.Available with fabric reinforcement. Used for screening of fines and materials with high moisture content.Thickness varies from 3mm to 6mm. Copyright © Swagath Urethane .